An easy to follow fantastic Dutch Oven recipe! There’s nothing better than slow cooking a stew in a dutch oven, perhaps on the top of a hill – many miles away from civilisation! Just picture that scenario of pure relaxation and freedom – fantastic! A Dutch Oven makes a great gift idea too! 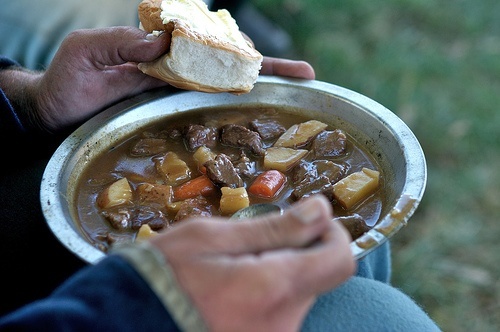 So, imagine being out and about for a day, maybe walking or enjoying a countryside pastime with your family or friends then, when it gets near to lunch time, you can all enjoy a nice hot stew, freshly made from your own Dutch oven. All you will need to do is make a safe camp fire (using coals is best) and then carefully place your Dutch oven on top of the fire and follow the cooking instructions below. Also, below is an example of a venison stew recipe, but feel free to add your own favourite veggies to the dish or alternatively substitute any of the vegetables you don’t like with something else! Then, simply stew and enjoy! Add olive oil to the dutch oven and fry the sliced onion and garlic until lightly brown. A dutch oven is so easy to use! Enjoy your stew! Please always take great care when using a Dutch Oven and keep yourself -and others- safe! Love the quality & style of our range of Hoggs of Fife products | Gift Ideas for Him & Her!